I was overjoyed when I discovered D2L has a LaTeX equation editor, but like you, somewhat dismayed at the MathML output. Why bother to include MathJax only to force it to use MathML, especially when not every browser supports it? 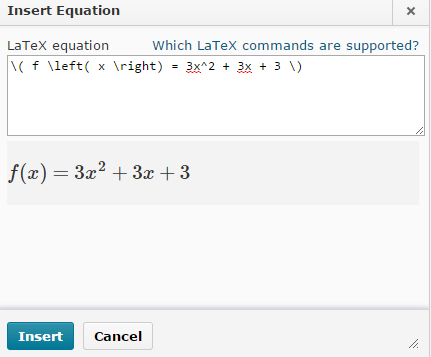 Are you aware you can edit the original LaTeX equation in the WYSWIG editor? 1. If you click on the big yellow square representing the equation you want to edit, the Equation tools icon on the toolbar will automatically switch to LaTeX if it’s not already selected, and it will become blueish. 2. Click on the Equation tools icon now. 3. 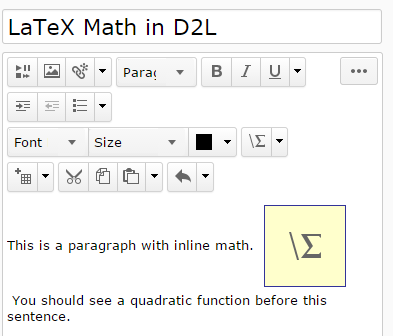 The LaTeX equation editor will open, with your original LaTeX displayed in the textarea. 4. Change the LaTeX, and click Insert. 5. Save the changes to your HTML file. When you view the saved file, you will see your equation has been updated. I’ve also been playing around with using D2L’s document templates feature. It allows you to create a template file that you can insert into a blank content file as a starting point. So you could add your call to the MathJax script to this template file, along with calls to a stylesheet, etc., and that way you wouldn’t have to add all that manually to the HTML source every time you make a new page. I didn’t know you could edit like that… I’ll have to take a look! I’ll be sure to share that with the other math e-Learning teachers in my board (we’re meeting in a week). 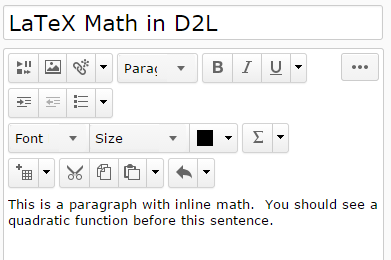 I’m still hesitant to rely on that feature, since the LaTeX isn’t “active” in the page that D2L “generates”. 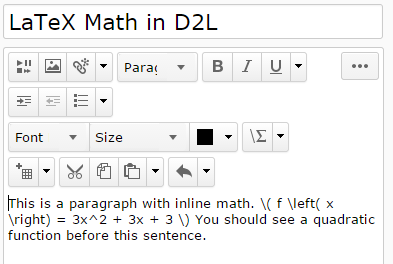 If we were ever to move away from D2L, I might lose any easy way to edit my math… tough call. Re: “if only I had a WYSIWYG HTML editor that produced *simple* HTML code”, it seems like us mathies have wanted this forever. This is definitely something that we struggle with in our office when creating and supporting courses. Agreed, Carrie. The amount of weird markup that D2L’s editor inserts behind my back is sometimes bizarre; it goes through weird contortions of logic that only make sense to an algorithm. For some reason in inserts both “sup” tags *and* a span with a class of “superscript” around superscripted things. o_O And tons of span tags to “correct” line-height. Until someone produces the holy grail of WYSIWYG HTML editing, I’d almost prefer having a Markdown editor side-by-side with a real-time preview pane. People with some HTML/CSS skill could define template divs and stuff for the fancier boxes, and everyone else could use those and the relatively simple syntax of Markdown and see the results in real-time.